For almost three quarters of a century from the 1870s to the 1940s, HK-based Fung Tang (馮登記, Fung Tang Kee in Chinese) was a powerhouse in the transpacific metals trade with branches in Shanghai and three cities in Yunnan, affiliates in the US and Japan and even operated its own tin refinery in Sai Wan. Although largely forgotten today, the firm’s eponymous founder Fung Tang and his son Fung Kong-un were prominent leaders of the Chinese community in HK and beyond. A native of Jiujiang (Kow Kong) in the Nanhai county (南海九江) in Guangdong, Fung Tang followed his uncle Fung Yuen-sau (馮元秀) to California in 1857 at the age of 17 and worked at Tuck Chong & Co (德祥號辦莊), a trading business founded by his uncle and his fellow Nanhai native Kwan Chak-yuen (關澤元). In his spare time, he learned English from Reverend William Speer and became fluent in the language. With his linguistic skills, he became a bridge between the Chinese and the white community in San Francisco and even befriended Peter Burnett, the first Governor of California, who described Fung in his memoir as “a cultivated man, well read in the history of the world, spoke four or five different languages fluently including English, and was a most agreeable gentleman, of easy and pleasing manners”. Record shows that Fung first went to Hong Kong from California in 1860 where he sent back 18 boxes of prepared opium to San Francisco. By 1865, he was already quite prosperous as the partner of Wo On Yu Kee, a firm in Sacramento, California and was an avid investor in gold mines. In 1869, he delivered an eloquent speech chiding the US government for its anti-Chinese laws which was reprinted in English newspapers in the US and HK. When his uncle forbade him to bring his wife to America, he left his uncle’s firm and joined up with a China trade merchant by the name of Simon L. Jones (1813-1890). This began a highly successful partnership that would last for decades and three generations. A native of Wales, S.L. Jones arrived in Mexican-controlled Texas at the age of 16 and later became a senator of the short-lived Texan republic. When Texas became a part of the United States in 1846, Jones became involved in the cattle trade between Mexico and Texas but later moved to Alabama where he married the daughter of a judge. In 1852, Jones joined Cobb & Co, a China trade and auction house in San Francisco at the invitation of the founder General Henry Adolphus Cobb whom he knew from Texas. Four years later in 1856, Cobb sold his shares and the business was renamed S.L. Jones & Co although the two families remained close as Jones’ son Everett D. Jones married Cobb’s daughter Eugenia Cobb. With the help of Fung, S.L. Jones became one of the leading China Trade firms in California by the 1870s, exported over US$700,000 worth of Californian wheat to Hong Kong (it was also allegedly one of the largest exporters of Californian flour) and had annual China trade volume of over US$1 million, which was double the size of Macondray & Co, another leading China trade house in California at the time. In 1872, Jones acquired 1500 acres of farmland in Woodside, California and through the help of Fung imported large number of Chinese labor to build the Hazelwood Farm which included orchard, horse ranch and an 80 acres grapes farm which produced raisins for exports to HK and wine grapes for vineyards in California. (In 1905, Jones’ son sold the Hazelwood Farm to the Folger family of the coffee fortune as a private horse ranch and it is now a garden open to the public) Jones always treated Fung as an equal partner, which was unusual at the time when racial discrimination against the Chinese was rampant in America and during the public discussion leading up to the Chinese Exclusion Act in 1882, Jones publicly spoke out in support of the Chinese immigrants. When Jones died in 1889, most of the businesses in San Francisco’s Chinatown closed for the day in mourning. 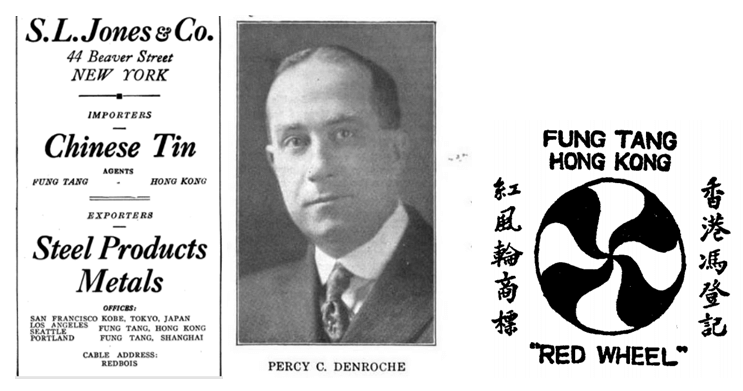 His son Everett and later Everett’s son in law Percy Charles Denroche (1872-1948) took over S.L. 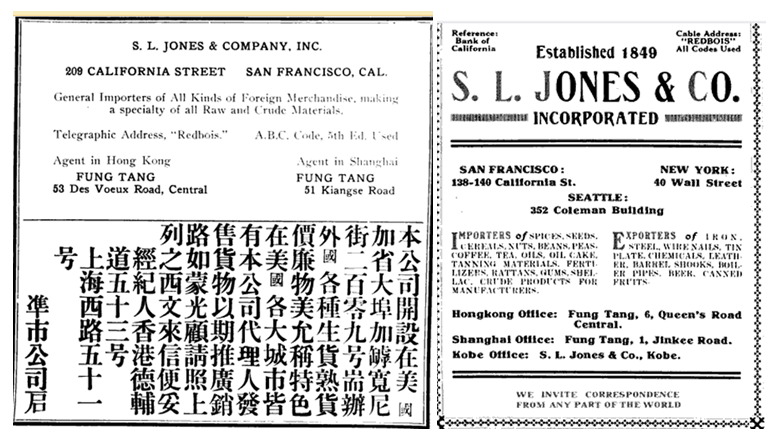 Jones & Co and its partnership with Fung Tang lasted until at least the 1920s. Starting in 1870s, Fung spent most of his time in Hong Kong where he established Fung Tang as the agent for S.L. Jones & Co in 1870 and I Cheong Ching(怡昌正), a Gold Mountain firm (金山莊, which firms that trade with America were known as since San Francisco was referred to as “Gold Mountain” during the Californian Gold Rush; when gold was later discovered in Australia, it became “Old Gold Mountain” while Australia was referred to as “New Gold Mountain”) specialized in “specie”. In an 1888 ad, Fung Tang’s address was listed as 42 Bonham Strand and its business being an importer of California flour, general commission merchant and agent for S.L. Jones. Aside from trading, Fung was also involved in Western style financial institutions having served as comprador of Oriental Bank (東藩滙理銀行, the first bank in HK, established in Bombay in 1842, reconstituted as New Oriental Bank in 1884 and shut down in 1892) and board member of Chinese Insurance Co Ltd. (華商保安公司), an insurer formed by the American trading house of Olyphant & Co and chaired by Jewish merchant E.R. Belilios, from 1875 to 1888. Outside of business, the bilingual Fung Tang quickly established himself as a community leader in the British colony. In 1875, Fung was appointed to the “Committee on Emigration of Women to America” by the US consulate in HK. From 1878 to 1899, he was on the Jurors List, with only a break between 1894 and 1896. In 1879, he was elected to the board of the Tung Wah Hospital, representing the Gold Mountain guild. The same year when the American general Ulysses S. Grant (later president) visited HK, Fung was part of a select group of Chinese community leaders which included Ng Choy (Wu Tingfang, first Legco councilor of Chinese descent and later Chinese diplomat), Leung On (Gibbs & Co comprador and co-founder of Po Leung Kuk), Li Sing (spelled Li Shing in report, see DHKB article) and Ho A-mei (spelled Ho Ami in report, business partner of Li Sing and involved in Lantau mine, see article) and invited to the Governor’s house to meet with the general, highlighting his social status. Fung Kong-un’s name first appeared in 1904 under the entry for Fung Tang in the Directory and Chronicle of China, Japan, Corea and Indochina. Fung Tang was listed as a commission and shipping agent with offices at 64 Queen’s Road and 105 Wing Lok Street. Other individuals listed were Fung York, J.A.S. Alves and Chun Chok-chee. In 1913, the firm’s address was listed as 53 Des Voeux Road Central with a branch in 51 Kiangsi Road in Shanghai but by 1919, it was operating out of 6 Queen’s Road Central and its Shanghai branch was located in 1 Jinkee Road. By 1928, its head office was located at Pedder Building in Central. According to newspaper reports in the US, Fung Kong-un allegedly visited America for the first time in 1913. He was described as the “Rockefeller of China” who spoke good English and his firm “the largest exporting concern in China” although his negative comments about American women to the reporters caused quite a stir. 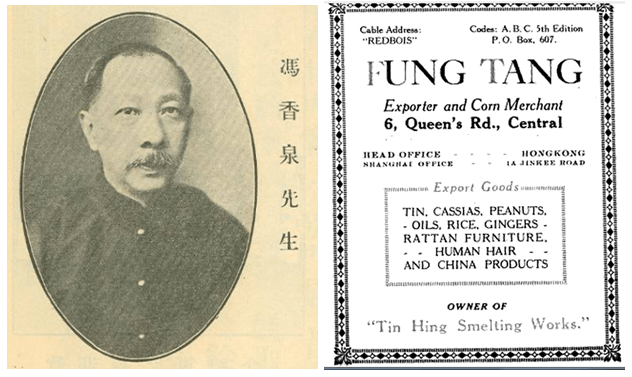 In its early years, Fung Tang’s primary focus was in importing Californian flour from the US and exporting Chinese tea to America. The list of Chinese exports also included oil, peanuts, rice, gingers, cassia, rattan furniture (see article) and even human hair and the American imports also included chemicals, leather, beer and canned fruits but by the 1910s and 1920s the firm had become a major player in the metals trade, exporting Chinese tin to America and importing iron and steel products from the US. The tin was procured from the Yunnan province which was the center of tin production in China and as a result Fung Tang established 3 branches in Yunnan – Yunnan Fu (now Kunming, the province’s capital), Mongtze (Mengzi 蒙自, a main trading center in the region) and Kokiu (个旧 Gejiu, where the mines were located which had 900,000 tons of tin reserves, the largest in China). In the 1910s through 1930s, tin from Yunnan were primarily shipped to HK to be refined and the trade was dominated by six firms in Hong Kong which also had their own refineries. Of the six, Fung Tang was the largest and 3 other key players were Wing Hong (永康) operated by Ng Hiu-sang (吳曉生), Sing Lee (成利) and Chee Hing (志兴) operated by Lee Fung-chee (李风侍). Fung Tang’s tin refinery, the Tin Hing Smelting Works, was situated at 306 Des Voeux Road West with annual productive capacity of about 4000 tons. The works refined tin obtained from the interior of China to a uniform purity and then market them globally under the “Fung Tang” brand. At Fung Tang, Fung Kong-un was supported by Wong Tak-kwong (王德光), who was formerly an assistant at Sincere & Co. Another lieutenant was Charles Martinho de Selavisa Alves (presumably a relative of J.A.S. Alves listed in the 1904 directory), whose name first appeared on the 1917 juror list with his home address listed as 39 Wong Nei Chong Road. Outside of Fung Tang, Fung Kong-un was involved in several major enterprises. He was the majority shareholder of Sui Kat Bank (瑞吉銀號), one of the leading traditional Chinese banks in HK in the early 20th century founded in 1884 by Kwok Lai-tun (郭禮端), a director of Po Leung Kuk. Fung left the day to day operations of the bank to Cheung Man-hing (張文興) and Kwok Kwan-mui (郭君梅, presumably a relative of Kwok Lai-tun) but when he felt like the bank was mismanaged, he filed for the bank’s liquidation in 1931. Outside of business, Fung Kong-un like his father was very active in the community. In 1911, he and his fellow Nanhai natives such as Tang Chi-ngong (proprietor of Tang Tin Fook Bank and father of Sir Tang Shiu-kin, great grandfather of Sir David Tang), Quan Kai (關俊臣, owner of Kwong Hee Ying, major agent of American flour and comprador of shipping companies) and Sum Pak-ming (shipping comprador) formed the HK Kow Kong Commercial Association (旅港南海九江鎮商務局, now 旅港南海商會), which exist to this day. In the early 1920, he was involved in the founding of the Anti-Mui Tsai Society which was formed to abolish the mui tsai (child slavery) system. Fung also considered himself a comprador and was involved in the founding of the Compradors Association (洋行辦房聯合會) in 1924 with members of the Hotung family and other compradors and was closely involved with the Chinese Chamber of Commerce (香港華商總會, the predecessor of the Chinese General Chamber of Commerce) for decades. In 1927, he was the host of private parties for former Chinese premier Tong Shao-yi and Treasury Secretary of the HK colonial government, highlighting the extensive reach of his network. In 1930, he was appointed non-official Justice of the Peace. In 1933, he was listed as the only Chinese member of the Metals and Sundries Sub-committee of the HK General Chamber of Commerce. In 1937, he became a member of the Court of the University of Hong Kong. According to the Minerals Yearbook in 1940, “restrictions on exports from Yunnan during the last 6 months of 1939 appear to have brought about the closing of the Fung Tang and Sing Lee refineries, as the Chee Hing, Tin Hing, and Wing Hong plants were reported to be the only ones operating in early 1940.” Fung Kong-un, who resided in 54 Bonham Road, died in September 1941, just months before HK fell to the Japanese. After the War, there were no records of Fung Tang as a firm. In 1951, one of Fung’s creditors filed to take over Fung’s estate which was granted. In 1963, Fung Kong-un’s third son Fung Kui-fei (馮巨飛) donated 3544 rare books to United College (one of the colleges of CUHK). This article was first posted on 9th February 2018.